I apologize in advance if you’re sick of the painting posts. Since the beginning of the year it’s been our main house priority. Especially being in New England and the wicked weather we’ve had this year we are pretty much stuck indoors. 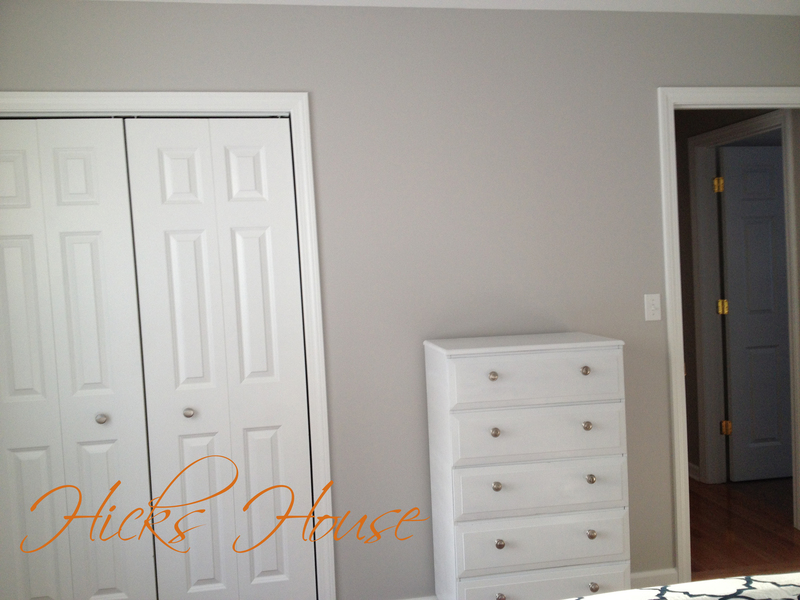 As I mentioned in this post the color we chose for our guest room was Stonington Gray. It’s one swatch down on the same color strip as the Coventry Gray we used in the dining room. I had also created the custom pillows to put on the bed with the intention of eventually altering some curtains to match. Here is the inspiration room we are kind of “modeling” the style of the room after. So far I think we’ve got the bedding nailed. 😉 I actually like my pillows better – I’m not a huge fan of pink. We followed the same painting technique we’ve done in the other rooms we’ve painted so far which is I cut in the ceiling with Ken following behind taping off the baseboards and side of the doors and windows. The taping generally takes less time than the cutting in so Ken then moves on to rolling the walls while I follow behind getting all the top of the baseboards and next to all the window and door frames. What do you think? I love that the gray in the walls makes the white nightstands, dresser and trim POP. It’s still a little too much white though so here’s what’s still left to do. So that’s the current progress. What do you think? Categories: Guest Room | Tags: benjamin moore paint, coventry gray, decorating, decorating blog, diy, diy blog, gray bedroom, gray walls, guest room, painting, stonington gray | Permalink. I don’t know about you, but one of my personal pet-peeves whenever I spend the night somewhere is not having somewhere close to the bed to put my phone. Guest rooms and hotel rooms are harder to sleep in as it is for the simple fact that it’s not your room. Having my phone which I use as both a clock (to see what time it is in the middle of the night when I can’t sleep) and an alarm clock (to let me know when it’s socially acceptable to leave the room). Whether everyone is like this or not, everyone should have the opportunity to do this when they stay at The Hicks House. That’s why we were on the hunt for not one but two end tables. They had to be white for one to match the dresser we spray painted, they had to look nice, and they had to be cheap. This is the guest room after all, they won’t have the everyday wear and tear that the dressers go through in our room. This hunt took a lot longer than I would like to admit. I feel like when I was looking for dark wood furniture over the last few years, everything in the stores was white… now that I wanted white everything was dark. Uggghhh. Finally we found something we liked at Target.com it was also on sale score so we ordered it. The fact that it came Ikea style was ok – I mean it was expected after all and it was cheap. It went together pretty quickly too. Ken had both put together in about an hour. Then we added some fab lamps we also found at Target – in the store though. The shades are a bit too big, but they were clearance $5 so we made the executive decision that they looked just fine. We had a perfectly perfect lamp that matched bedspread it had the same pattern only in the reverse white on blue instead of blue on white. The problem was that I only got one, and despite a statewide hunt of varying HomeGoods I could not find another. But these look pretty neat too. 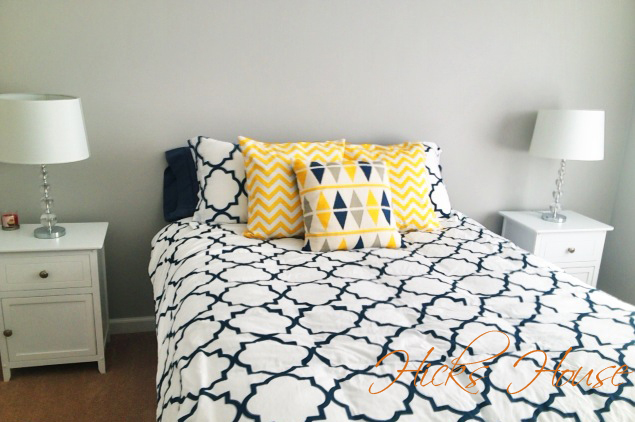 Categories: Guest Room, The Hicks | Tags: decorating, design inspiration, diy, furniture assembly, guest retreat, guest room, night stands, visitors | Permalink. Luckily we had the spare mattress and metal frame in storage in our condo garage leftover from when we replaced our own mattress. We decided not to throw it away so when we finally bought a house we wouldn’t have to buy a new guest mattress – I know we’re planners. What we didn’t have was linens for the guest room (not any I liked anyway). There is a master plan for the room. We couldn’t decide if we wanted to use yellow or light blue as an accent color so I think we are going to do both which will give us the ability to switch it up. Maybe yellow for fall and winter to brighten up the room and light blue for spring and summer? 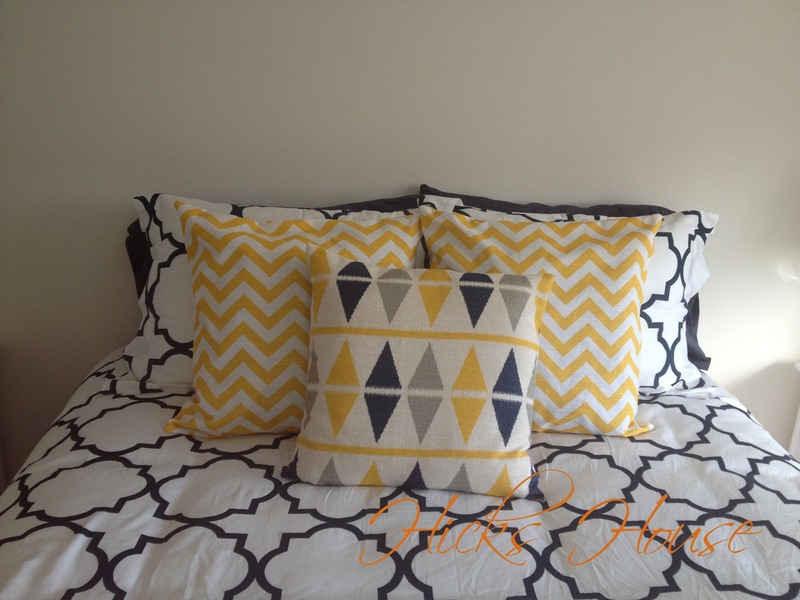 I’ve bought all the accent fabric to make throw pillows to add to the bed – hopefully coming soon. The accent colors will also be mirrored in the curtains. We have some short white linen linen like curtains and had the idea to sew a piece of velcro on the bottom so that we can add swappable colored panels to make them full length. This is a really cool project I’m excited about getting to at some point. For extra furnishings I plan to refinish an old mid-century modern dresser that was left behind in our condo attic. A couple coats of white spray paint and it should look more in line with the overall feel of the room. Nightstands are also needed. Someday I’d also like to try to tackle those awesome upholstered headboards I see online and obviously some wall color – something neutral but more fun than the drab off white thats there now. So that’s it – nothing to brag about yet, but a step up from an air mattress on the floor. What do you think? Categories: Guest Room, The Hicks | Tags: decorating, design inspiration, diy, guest room, interior design, navy blue, quarterfoil, sleepovers | Permalink.